Into the note-filled back pages that are of nostalgic interest to me but may be dull and befuddling to the casual reader. As such, we'll sprint through to the end of the book and start on a new one (with more pictures) next week. The terrible, terrible "poetry" is copyright Dr Nichola J Coleman (though I suspect I may have contributed a line or two). The Thai green curry recipe is rather better, if memory serves, and I may have to attempt it again sometime soon. Bigness of picture may be achieved in the usual fashion, if desired. A Boy and a Bear in a Boat has been longlisted for the Guardian Children's Fiction prize, which is a nice surprise. The Main Squeeze and a couple of also hugely talented pals, collectively trading as the Inky Crows, will be hosting a guerrilla open studio chez nous the last three weekends in July. You can follow news of their preparations at their blog. 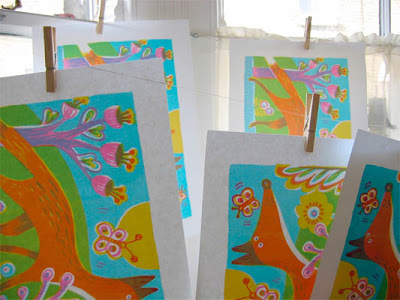 Most recently, acclaimed children's picture book illustrator Paula Metcalf has made an irritatingly beautiful screenprint at her first attempt.